Birds Of A Feather Aren't Necessarily Related : Shots - Health News Geneticists have revised the evolutionary tree of birds, revealing some unlikely relationships. 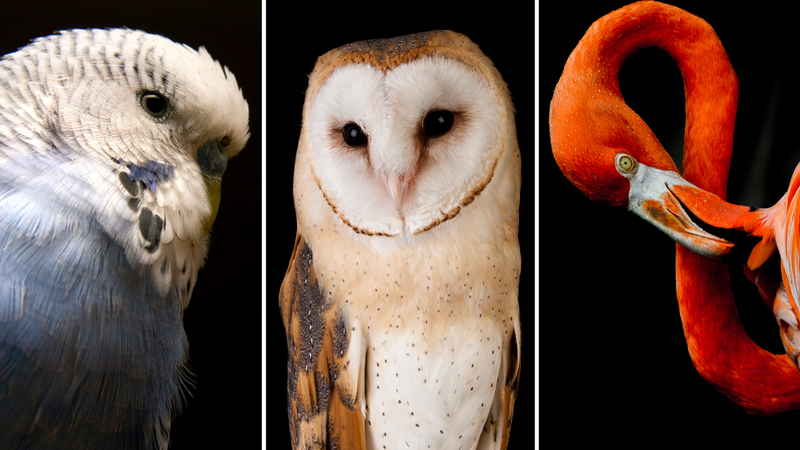 Recent research sequenced 48 bird species, including (from left) the budgerigar, the barn owl and the American flamingo. What do a pigeon and a flamingo have in common? Quite a bit, according to a reordering of the evolutionary tree of birds. One of a series of studies published Thursday in Science is the latest step toward understanding the origins of the roughly 10,000 bird species that populate our planet. "We're finally reaching some sort of consensus about how we think birds are related to each other," says Sushma Reddy, a researcher at Loyola University who studies bird evolution and was not involved in the new studies. Understanding the relationships among different types of birds has been a subject of great debate among scientists because of birds' unusual start. Birds began as dinosaurs. And for a long time, their ancestors were just hanging around with all the other dinosaurs. That all changed roughly 66 million years ago, when a large asteroid impact triggered a mass extinction on Earth. Though land-based dinosaurs died, a few bird ancestors survived, explains Edward Braun, a biologist who studies bird evolution at the University of Florida and contributed to the new analysis. With the big dinos out of the way, the birds spread their wings and covered the entire globe. They quickly evolved to live at sea and on land — everywhere from deserts to the arctic. "The major groups of birds appeared very rapidly," Braun says. 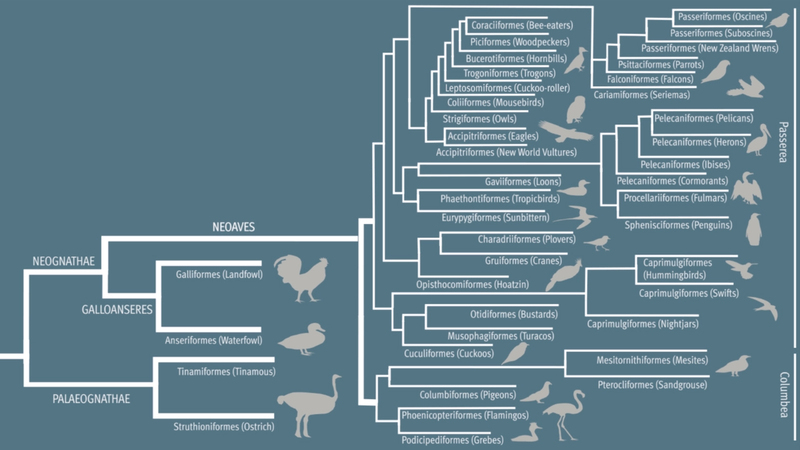 The updated avian tree shows how many different kinds of birds evolved quickly after a mass extinction 66 million years ago. That's why it so hard to tell who is related to whom. Today's bird species all look and sound very different from each other. "Owls look very distinctively like other owls," Reddy says. "But there are very few characteristics that would put an owl with any other major group of birds." The confused family tree has been frustrating researchers like Erich Jarvis, who is an architect of the new studies. Jarvis, a neuroscientist at Duke, has been trying to figure out how different birds learn their songs. To do that, he has to know how the birds are related to each other. He decided the best way to sort this out was to sequence as many bird genomes as possible. "We just, basically, put out a call and had people come together who were sequencing bird genomes," he says. More than 200 researchers got involved, sequencing 48 avian genomes. Then they fed that genetic information into supercomputers. The computers crunched the data, and out popped the most likely evolutionary tree for birds. It shows that "only four lineages survived that massive extinction," Jarvis says, "and they gave rise to 95 percent of the species we have on the planet today." The songbirds Jarvis studies also appear to have independently evolved genes that are similar to those that shape the language areas of the human brain, he says. The overall tree reveals some surprising relationships among bird species. Parrots are actually close relatives of falcons. Pigeons are more closely related to flamingos than they are to crows. And land fowl, like chickens, are related to ducks. Julia Clarke, a bird paleontologist at the University of Texas, Austin, thinks the reorganized bird chart that's emerging from all that data crunching is probably correct and is beginning to reveal a clear picture of avian evolution. "We seem to be sort of converging on a single answer," Clarke says. She's also a bird-watcher and says the genetic studies haven't found their way into bird guides yet. "A lot of this stuff, I think, should be very compelling to bird-watchers," Clarke says.